For the past few years, Pop Up Playground has played host to an outdoor international games festival dedicated to gamers of all types. Whether you prefer tabletop action or running round city streets, looking for clues, this festival offers plenty of gaming fun. 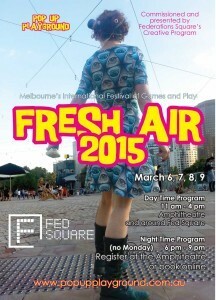 This year’s Fresh Air will take place Mar. 6 – 9 in Melbourne’s Federation Square. The festival, which starts at 11:00 a.m. will feature local and international game designers like Christy Dena, Georgia Symons, Kilkenny Games, and Snapstone Games. Street games include City Dash by Fire Hazard Games, and Folly, a new city wide urban role-playing game. Other games include “One Hat to Rule Them All” and “Professor Pendulum Perpetual Time Pummeller,” both of which are brand new games created by Pop Up Playground specially for the festival. Australia-based game designer Escape Room Melbourne will be in attendance with a brand new full sized puzzler called Escape Van. Fire Hazard Games will also be hosting their tabletop storytelling adventure Flashpoint Fairytale. I don’t know about your hometown, but I sure would love an outdoor games festival in my town. This sounds like tons of fun.